This script will clean the orphaned entries out of your Scripts.ini file. Please backup your files before running (just in case). I recommend Trix's Backupscript. The script is very basic. It reads through the Scripts.ini file looking for [SomeScript] followed by Filename=somefile.vbs, then checks to be sure that somefile.vbs exists. It puts up a message box for each script entry it can't find. Click yes to delete the entry or no to leave it in place. It repeats with a new message box for each missing script. Tested on MM3. Last edited by onenonymous on Sun Mar 23, 2008 2:16 pm, edited 3 times in total. I cannot test this for you since I just cleaned up my scripts.ini in order to fix problem with RC4S script, but I have one query. Does this give a report of what it will be cleaned out of the ini file? If not, would it be possible to add some type of report, I would like to know what is being removed. For now, it's pretty basic. It puts up a message box for each script entry it can't find. Click yes to delete the entry or no to leave it in place. 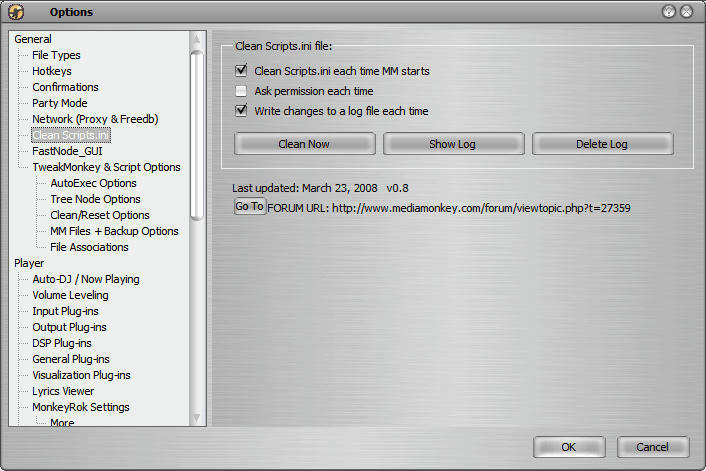 It repeats with a new message box for each missing script. When I get a chance, I'll enhance it to read through the entire file, the put up one dialog box showing all missing scripts with a checkbox by each to let you choose which ones to delete. No need to enhance any further, the message box would be enough for me to know whether I wanted it removed or not. One other question, if there are ini entries which are commented out, will it ask to delete those?? It shouldn't. 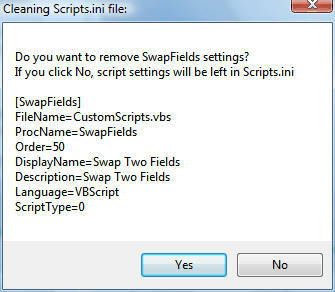 It looks for [SomeScript] followed by Filename=somefile.vbs, so if those are commented, they will be ignored. Cool Too bad I don't have any way to test it. Maybe add a messagebox if no problems were found as it was confusing to know wether it had run sucessfully or not (looked at the log file). RedX wrote: Maybe add a messagebox if no problems were found as it was confusing to know wether it had run sucessfully or not (looked at the log file). It is supposed to do as you suggest if the 2nd check box ("Ask permission each time") is checked. I checked my code and had a an extra 'Not' that I forgot to remove. I'll fix and re-post. EDIT - installer has been updated. Is it possible to have this script review the scripts.ini file and put the script data in the order that the user specifies? Right now I have my script.ini file separated by script type and ordered alphabetically but each time I install a new script I have to manually reset the order. Is something like this possible or will I have to keep doing it manually?? I've got my working copy with a button to sort the entries alphabetically. I need to clean it up so it can be posted. I'll see about doing that this weekend. Did you ever do nyn's request? Wow Vyper I forgot about this one, but I've still having to update my ini manually and I install a lot of scripts but I guess this is the beast I have to live with. Unless of course the scripters figure out a way to not overwrite the ini entries if they already exist?? This one got back-burnered behind my other scripts (and life away from the monkey...). I'll see about re-visiting it one of these days. If I recall, I changed my parsing routines that reads scripts.ini in my RCFS script, and intended to use that in this one - just never got to it.